I LOVE the feeling that comes with Christmas. There is something magical in the air that is contagious! The trick is to find how you can bring the true meaning of Christmas into your home. Now a days this can be prove to be difficult. There are times when we find ourselves getting caught up in the materialism of Christmas. How, what, where and when are we going to get the best gifts for our kids! What deals are we going to discover, and the list goes on! If you ask yourself, “What can I give to my kids that will last with them forever!” The answer to this question I believe is this simple equation….. The Church of Jesus Christ of Latter Day Saints just launched their 2016 Christmas Campaign: #LIGHTtheWORLD. They are challenging families to serve, and follow the example of our Savior this Christmas Season. This is where the memories will come. Each day starting on December 1st, there is a theme to focus on. 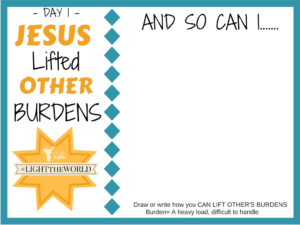 For example, on DAY 1 the theme is, JESUS LIFTED OTHER’S BURDENS. The challenge is to find a way to lift someones burden around you on that day. To find ideas and ways you can accomplish this, there are many resources you can go to. Mormon.org is the main source for this campaign and I have also seen mothersniche.com post ideas to do for each day. I have decided to approach this a little bit differently. There are so many different ways to serve, and I feel that each area and family is unique. I have come up with a daily routine that families can make their own. Printed Printables. Below are 2 links that will give you a link to a PDF copy of each printable. Each link contains 25 cards that go a long with each day of the #LIGHTtheWORLD campaign. You will first want to wrap an empty box in wrapping paper. Cut a slit in the top of the box big enough to accommodate the pictures you printed out. 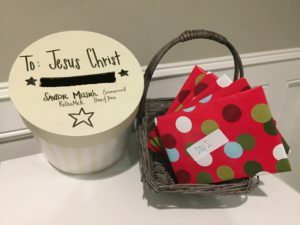 Label the box and address it, TO: JESUS CHRIST, or TO: MY SAVIOR, or TO: THE PRINCE OF PEACE. There are many different names you can use here. Have your family choose one, or multiple. My favorite is TO: MY SAVIOR. 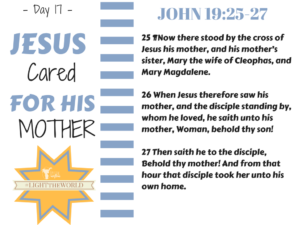 Next, print out the scripture story printables (lighttheworldscripturesstories) onto card stock if you can. You can also laminate them to help make the cards last longer. Also print out the daily blank cards(lighttheworlddailyblankcards). These 2 printables will correspond to the #LIGHTtheWORLD campaign. 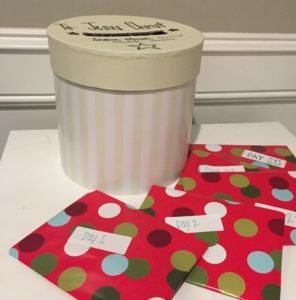 Cut out each card and wrap the DAY 1 scripture story card and Day 1 Blank Card in some wrapping paper together (Make sure you include a blank card for each member of your family inside your gift). 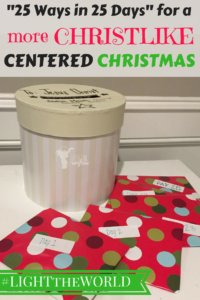 Label the corresponding day on each gift, and place these gifts in a basket under your tree. Place the wrapped box under the tree with the basket. #2-Open Day _?_ gift from the gift basket under the tree. #3-Read or share the scripture story labeled for your morning scripture study. #4-Brainstorm as a family how you can accomplish the days challenge. Each area, family, and situation are so unique that there are many different ways to accomplish this. When your child comes up with an idea, run with it. If it is their idea, it will make the experience more personal for them. #5-Focus and carry out the families idea for that day. #6-Each night find time to gather together and talk about who, what, where and when someone was served that day. #7-Using this printable, each of you write or draw your thoughts and actions that your family did that day to serve others. There are 25 cards, 1 for each day of the campaign. Click the link below to get your own printable for your family. #8-Place this card in the box labeled To: JESUS CHRIST under your tree. On Day 25, or Christmas Day, open the box under the tree and read through with your family all the service that was given in the last 25 days. Your children should feel joy as they read these and feel they have made a difference. “PUT UP LIGHTS……TURN ON THE LIGHTS………BE A LIGHT!